Named the best Whisky in the world by Jim Murray in the 2015 Whisky Bible, this is the greatest accolade a Whisky can hope for, and the only incentive we needed to go on a hunt for it and give you a chance at a taste. As befits a Sherry matured dram, it’s infused with intense, fruity aromas and an impressive deep copper hue. This is pure poetry in a bottle. 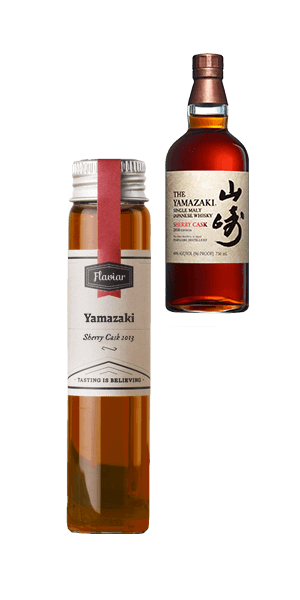 What does Yamazaki Sherry Cask 2013 (Tasting sample) taste like? The Flavor Spiral™ shows the most common flavors that you'll taste in Yamazaki Sherry Cask 2013 (Tasting sample) and gives you a chance to have a taste of it before actually tasting it. When people say that the Japanese pursue perfection when they make something, this is the best example of it. The Scottish can learn from these guys, as this is what perfect tastes like.